This machine have 220V and 110V voltage, Please choose to suit their own national standards voltage. The technical parameters of operation. 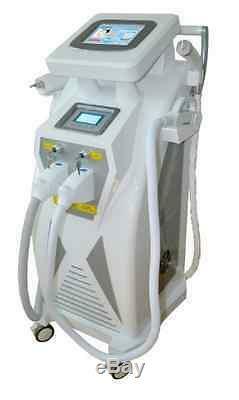 530nm, 560nm, 580nm--Skin rejuvenation, Pigmentation Therapy, Acne Treatment. Pay attention: the filters above are optional. 640nm:blacker&thicker hair, smaller first pulse, longer pulse delay. 690nm:light-colored&thin hair, longer first pulse, shorter pulse delay. One course in all, every months as one treatment, 4-6 treatments in all. Significant effect will show you after 2-3 treatments. For thick hairs, it needs 3 treatments. For soft and thin hair, it needs 5 treatments. Treatment time: For two arms: in 1.5 hours. For two legs: in 1.5 hours; For armpit hairs: in 30 minutes. Every month as one treatment. Because the hair has its own growth period and. Dormant period, so its effective to remove the hair in growth period. Feelings in the treatment: some pain feelings like needle pricking. Treatment, a little inflamed feelings on skin. Gently tweezer(or use your fingers) the hair. Root, naturally shedded and no pain, which means the best effect. In this case after 7 days. The hair will loss automatically. Effect of cooling gel: cooling and light transporting. Usage: spread the cooling gel on the treatment area before treatment, about 3mm. Thickness; 20 minutes after the treatment, scrape the cooling gel, or cooling with ice for. 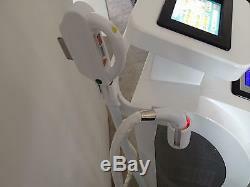 Operating sequence: shave away unwanted hair or shear the unwanted hair, 1-2mm to. The hair root first, then Clean skin and spread cooling gel on the treatment area; after the. Treatment, make an ice cooling treatment. 530nm:darker skin, smaller energy, long pulse delay. 580nm:whiter skin, higher energy, short pulse delay. 530nm:rough skin, bigger first pulse. 580nm:smooth skin, smaller first pulse. 560nm:thick&good skin, higher energy. 530nm:thin&poor texture skin, smaller energy. 560nm:eye pouch, wrinkles, course pores. One course in all, every 3 weeks one treatment, 4-6 treatments in all. For face treatment, it needs about 30. Pre-operation: deeply skin cleaning, remove acne, blackhead. Feelings in the treatment: Swollen feelings inside skin. A little inflamed feeling on skin. Thickness; 20 minutes after the treatment, scrape the cooling gel, and cooling with ice for. Operating sequence: Clean skin and spread cooling gel on the treatment area; after. The treatment, make an ice cooling treatment. 1-2 course (very serious skin problems, it needs 2 course), 3 weeks one treatment. Treatments in all, very significant effects show after 2-3 treatments. Feelings in the treatment: very swollen feelings inside skin. Feelings on skin after the treatment. Operating sequence: Clean skin and spread cooling gel on the treatment area; after the. 430nm: rough&bigger vascular, longer first pulse. 480nm:smaller vascular, smaller first pulse. 530nm: red face, bigger first pulse. 4-6 treatments as one course, one or two course in all. Very obvious effects will show. Every 3 weeks as one treatment. A little inflamed feelings on. 580nm:light-colored spots, poor skin texture. 560nm:darker spots, good skin. 560nm:darker spots, poor skin texture. 530nm:light-colored spots, good skin. 580nm:whiter skin, higher energy, shorter pulse delay. 1-2 course(2 course is for very serious skin problems, like serious chloasma), 3-4 weeks. One treatment, 4-6 treatments in all. Treatment symptoms: the freckles become darker after one treatment, the treatment. Area will be red, the freckles will gradually be light and drop off. In one week after the. Treatment, spots will be darker first. Usually after one cycle treatment, the perfect results. Thickness; 20 minutes after the treatment, scrape the cooling gel, and cooling with ice. The parameters above are just as your reference, you'd better start a little smaller energy. The first operation, then ask the patients if they feel like a slight tingling or a pinch similar to. The snap of a rubber band. You'd better repeat to shot the same treatment area. The black skin could easily absorb light, so when you adjust parameters of energy, you'd. Better use the smaller ones than the white skin. ALL RF energy must lower 3!! 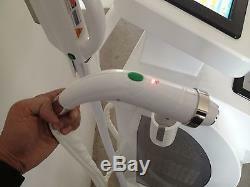 E-light=IPL +RF+ Skin contact cooling system. It's the new generation of beauty equipment, it combines with the functions of optical. It adopts elective absorption of light, which could get. Different impedance between target tissue and abnormal skin. Absorption of electromagnetic of target tissue in the condition of lower light energy, which. Could greatly reduce painless during treatment. To remove unwanted thick or tiny hair. To make your skin tightening, lifting skin, improving flexibility and tone of skin. To rejuvenate your skin: removing deep wrinkles, pigments, freckles, vascular lesions. Telangiectasis ; whitening skin, changing large hair pores. To remove Acne : Improving the situation of oily skin; Killing acne bacilli. E-light owns all advantages of traditional IPL treatment. No risk of burning and. Uncomfortable feeling cause by IPL treatment. Good result for blond hair and light-colored. Modular Design of inner structure, easy to repair. 3.8.4 TFT colorful touch screen. Pedal supplied, to meet your personal operation habits. Warns after treatment and Maintenance. Pay attention: In one month after treatment, the patient should use sunscreen. SPF15, when going out, you'd better take an umbrella and wearing a hat in case of. If your skin expose in the sun, it will increase the regeneration rate of melanoma. Directly result in excessive pigmentation. You should often use moisture mask to supply water to your skin. You'd better use a mask before treatment. Do not make up immediately after treatment. You'd better use the pure biological skin. Care products, not chemical products and the silty cosmetics. If there's flare on treatment. Area, a doctor should be notified immediately and stop make-up. Take some Vitamin C or. Treatment course:6-8 times as one course, 2-3 course in all. Be carried out after 3 weeks. After one course treatment, the problems such as age spots. Spots will be solved, the skin becomes shiny and flexible. As physical differences in personal, individual customers may be temporary discomfort. Small blisters, pigmentations, flare, in this case, we suggest you use ice pack for 30. Minutes, you can make up 5 days later after treatment. No stress on the Screen, prevent from breaking up. 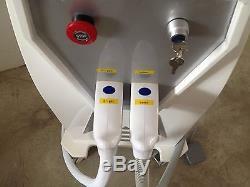 Keep the filters and probe clean, do not let the cooling gel enter into probe. Every 15 days to change the water. After changing water, please make sure water. If the probe continues being in high temperature after. You could change half of water from the machine. The temperature will reduce at once. To keep the powerful energy, we suggest you change the water after 3000 shots. Please check the surface of treatment head if there's attachment object after treatment. If so, please lightly clean it with lens paper or absolute alcohol. When the RF energy get into the skin, which could stimulate the water molecules of. Dermis to rub each other then make a lot of heat, when the temperature reach at 68-72. 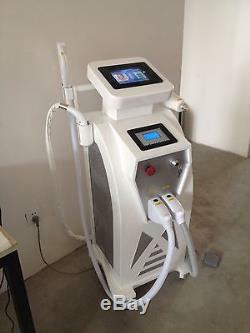 Degrees, it will stimulate the dermis layer of collagen fibers immediately contract, and. Stimulate collagen reconstruction and reborn of long-term. Show you younger and elastic. Immediate result: when the temperature of hypoderm arrive at 68°C-72°C the collagen. Will immediately shrink, at this time, the loose skin will lift and tighten at once. Wrinkles will disappear, the deep wrinkles will be lightened after one treatment. Long term effect: To stimulate the recombination and regrowth of collagen. Months after one course treat, return you a younger and flexible skin. 15mm:for eyes & face. Probes and RF handle (choose one probe and fit it in the handle). Eliminate spots, remove tattoos: The specific laser wavelength will effect on and melanin. The pigments will begin to swell and explode to tiny particles. After absorbed this high energy laser. One part of them will be shot out of the body, the. Other parts will be gradually removed by metabolism. Tighten skin, contract big pores: Spread specific fine carbon on face, after absolutely. Infiltrated in pores, then to shoot, it's easily burst the carbon particles to break out the. Spots and cutin of epidermis. The heat will stimulate re-growth of collagen, to tighten skin. To wipe out tattoos, to eliminate eyebrow cleaning, eye-line cleaning, age spots. Moderate treatment, no risk of scars and wound. It's the most moderate laser treat. Side effect, no recovery time, back to work at once. If you need more information or maunal the machine, Please message to me! The item "Professional Yag Laser Elight IPL SHR Tattoo Hair Removal Bipolar RF New machine" is in sale since Tuesday, February 16, 2016. 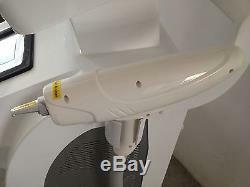 This item is in the category "Business & Industrial\Healthcare, Lab & Life Science\Medical Equipment\Other Medical Equipment". 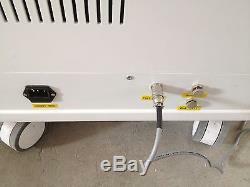 The seller is "new-diode-laser" and is located in default, default. This item can be shipped worldwide.